Fair play to Malta on the result. How the f**k Rooney and Lingard stayed on the pitch I'll never know. Rooney thinking he's Gerrard or Scholes every 5 minutes is damn right embarrassing, his passing is atrocious. Regarding Lingard, good movement but his use of the ball was sh*te, I saw him waste possession and passes so many times. F**k knows what the pundits saw which made them think he played amazing. Probably not the result they were hoping for. Could be in for a bit of trouble in that group now. BBC used to have an option to go to R5L, but it wasn't always synced. Alan Greene should be made to commentate on all games IMHO. My favourite commentator by far, but I could understand if he annoyed others. Disappointed at the Wales result, back to normal service it seems! If anyone is interested, France vs The Netherlands is on ITV4 now. Must be the worst Dutch side I can remember in my lifetime and I am no spring chicken! What on earth has happened to The Netherlands? Unfortunately I have had an afternoon nap, so I'll probably be staying awake for this one. 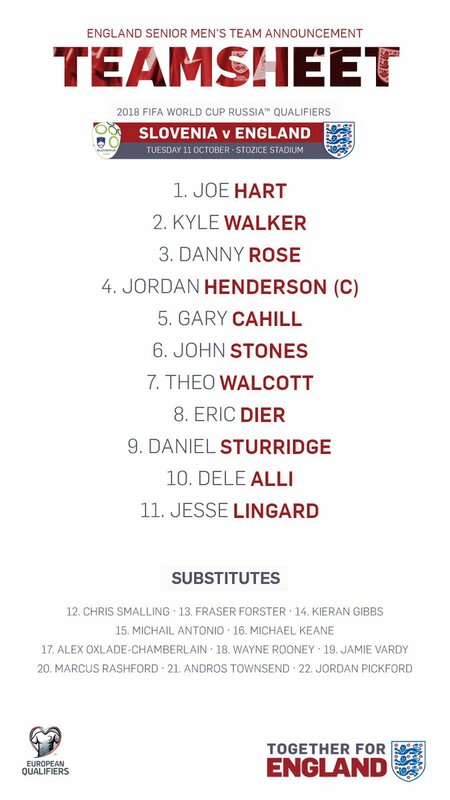 Hendo looks to be struggling, I suspect it's because there is not a designated role for him and Dier, no real sitter and it's as if both midfielders are given the role of a #8 box-box. Let's be honest - they're all struggling. Slovenia should be 2-0 or 3-0 up here. This is even worse than Iceland! Embarrassing stuff kind of typified by the fact that Jesse Lingered is playing. Soon to be up there in the 'Carlton Palmer Hall of Fame'. That save from Hart was mental. Dier and Henderson in midfield with zero creativity and pace. But...but...but...we had Rose, Walker, Lingard, Townsend, Walcott, Rooney and/or Alli on the pitch certain stages in the game. Surely that's enough creativity? I thought Rose was pretty good but how the hell Lingard stayed on the whole match............and no effing way is Dier a midfielder. Joe between the sticks did very well. hart was def motm by a country mile. slovenia shouldve won this game. a draw is actually a decent reault from how we played so Im happy to say we got a clean sheet . FFS, I thought that was the Internationals done until Feb/Mar next year. Nope, another round of games in November. Was there always 3 rounds before Christmas, from memory, I thought there were only 2? I know I hate the FA and the England team but seeing Scotland get the hammer gives me so much more satisfaction than any other national team getting beat could. The only good thing about the International breaks is that it gives me the opportunity to catch up on some much needed beauty sleep, hopefully there's another one coming up soon ! !